Is a Fixed or Variable Rate Mortgage Right For You? Fixed or Variable-Rate Mortgage? Which Is Better Right Now? If you are in the market for a home right now, you’re probably asking yourself if you should go for a fixed or variable-rate mortgage. How do you find an answer? Fortunately, it’s not all that difficult to make the right choice. First, a little background. Variable or adjustable-rate mortgages (also known as “ARMs”) used to be a complete landmine. That’s because lenders used to offer teaser rates to people who really could not afford the mortgages. Then, they’d really sock it to those borrowers once they got locked in. Fortunately, the rules changed and lenders can’t play those games anymore. Rest assured, if you qualify for a variable-rate mortgage, the bank thinks you’ll be able to make the payments. Typically variable-rate mortgages offer a period of three to seven years with a fixed rate. After that, the rate floats (usually up). Since most people don’t stay in their homes longer than seven years, the variable-rate mortgage can work well. After all, these adjustable-rate mortgages usually offer much lower rates (during the initial fixed-rate period) than the corresponding fixed-rate 30-year mortgages. But if you’re going to stay in your home and the mortgage enters into the adjustable period, you might get really slammed. So how do you decide between a fixed or variable-rate mortgage? When will the loan start adjusting? How much can the loan adjust up? How often can the loan adjust? Can the loan be converted to a fixed-rate mortgage? Let’s look at 7/1 mortgages to illustrate the point. (This means that after the first seven years, the rate can adjust every year.) For such a loan, assume the current rate is 3.65%. Most 7/1 loans can adjust by up to 2% per year to a maximum rate. In this case, let’s say the maximum is 9.625%. By contrast, a 30-year fixed mortgage will charge you about 1% more interest – so let’s say it’s priced at 4.75%. That being the case, you’re going to save a bit more than 1% each year for the first seven years with 7/1 variable rate mortgage compared to the fixed rate. If the rates do climb the maximum 2% each year, you can see that it doesn’t take long to be underwater with this kind of loan. Check out the chart above. You can see that during the fixed period (the first seven years), you rack up some pretty sweet savings. In fact, by Year 7, you’re 7.7% ahead of the game. So, to keep things simple – if you have a $300,000 loan, you’d be almost $24,000 in the green. But that savings gets eaten up quickly if the rates start adjusting in Year 8. You can see that by Year 10, you’re worse off with the adjustable-rate and the damage just gets worse every year. Some people think they’ll just refinance in Year 8, which makes sense to me. But what if rates are much higher then? What if you don’t have a job and/or don’t qualify for a loan for some other reason? Then you’ll be stuck with that terrible adjustable-rate mortgage. Bottom line? Variable-rate mortgages work if you are pretty certain that you’re going to move before the fixed period of the mortgage ends. 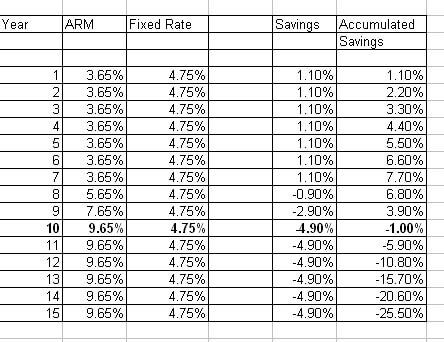 You might get lucky like many people over the last several years where adjustable rates stayed low. But that’s not a game I’d suggest you take a chance on playing. Where do you stand on this? Are adjustable rates just too low to pass up? Balloon Payment Mortgage – Good or Bad Idea? 30 vs. 15-Year Mortgage – Which Is Best for You? To me I like the comfort of knowing that my rate is fixed and not changing. In fact, in the short time that I actually sold mortgages I would show people ARM loans and they usually had no interest simply because they like the idea of knowing their payment is going to change on them.